Frontiers in Tissue Engineering is a carefully edited compilation of state-of-the-art contributions from an international authorship of experts in the diverse subjects that make up tissue engineering. A broad representation of the medical, scientific, industrial and regulatory community is detailed in the book. The work is an authoritative and comprehensive reference source for scientists and clinicians working in this emerging field. The book is divided into three parts: fundamentals and methods of tissue engineering, tissue engineering applied to specialised tissues, and tissue engineering applied to organs. 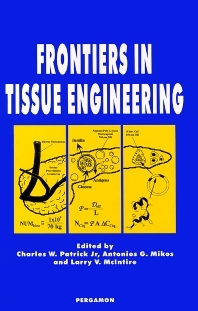 The text offers many novel approaches, including a detailed coverage of cell-tissue interactions at cellular and molecular levels; cell-tissue surface, biochemical, and mechanical environments; biomaterials; engineering design; tissue-organ function; new approaches to tissue-organ regeneration and replacement of function; ethical considerations of tissue engineering; and government regulation of tissue-engineered products. For clinical physicians, surgeons, as well as basic scientists in the fields of molecular and cell biology, biochemistry, and the engineering fields of chemical engineering and materials science. Chapter headings and selected papers: Preface (J.P. Vacanti, R. Langer). Prospectus of Tissue Engineering (C.W. Patrick Jr. et al.). Fundamentals and Methods of Tissue Engineering. Cell-cell interactions (S. Kukreti et al.). Mechanical forces and growth factors utilized in tissue engineering (K.J. Gooch et al.). Fabrication of biodegradable polymer scaffolds for tissue engineering (M.S. Widmer, A.G. Mikos). Wound healing (J.West). Musculoskeletal tissue engineering for orthopedic surgical applications (M.J. Yaszemski, A.W. Yasko). Tissue engineering and plastic surgery (M.J. Miller, G.R.D. Evans). Immunoisolation (M.V. Sefton et al.). Gene therapy in tissue engineering (J.R. Morgan, M.L. Yarmush). Ethical considerations of tissue engineering on society (T.W. King, C.W. Patrick Jr.). Tissue Engineering Applied to Specialized Tissues. Options for engineering bone (E.A. Burgess, J.O. Hollinger). Tissue engineering of cartilage (A.M. Rodriguez, C.A. Vacanti). Tissue engineered tendon (L. Louie et al.). Biodegradable polymer matrices in dental tissue engineering (L.D. Shea et al.). The regeneration of skeletal tissues with mesenchymal stem cells (A.I. Caplan et al.). Muscle tissue engineering (P. Petrosko et al.). Site-specific treatment of central nervous system disorders using encapsulated cells (F.T. Gentile, D.F. Emerich). Tissue Engineering Applied to Organs. Tissue engineering and the cardiovascular system (R.M. Nerem et al.). Engineering small intestine (J.J. Cunningham et al.). Tissue engineered kidney for renal replacement (H.D. Humes et al.). Tissue engineered skin (J. Teumer et al. ).